Home » Blog » Pricing of medicines: a short sighted issue? Pricing of Medicines: a short-sighted issue? Prices of drugs for outpatients have been lowered the past 20 years with 60% in the Netherlands (NL). The drop in pricing is actually even higher as discounts given by the industry have not been included in this calculation. This appears from calculations made by SFK, the Dutch Foundation of Pharmaceutical statistics which is associated with the Dutch Association of Pharmacists KNMP. The drop in pricing is remarkable as ‘expensive’ medicines¹ have drawn a lot of attention in the past years in NL. Existing drugs have dropped in price spectacularly. As an example: the price of Omeprazol, the most used “stomach protector” has dropped in the past 10 years from € 0,75 down to € 0,04 per pill. According to Roland van der Vaart, director of SFK, the drop in prices sheds a “different perspective” on the discussion about “expensive” drugs¹. In an earlier interview, Roland van der Vaart expressed his astonishment that manufactures are able to provide drugs at these prices. According to him, the industry seeks higher pricing for new drugs because they expect the prices to drop heavily in the subsequent years of the drug on market. The calculation of the drug pricing did not include drugs prescribed by hospitals. Costs of hospital expenses have risen highly by the introduction of expensive drugs for example for cancer and rheum, but recent data are not available. 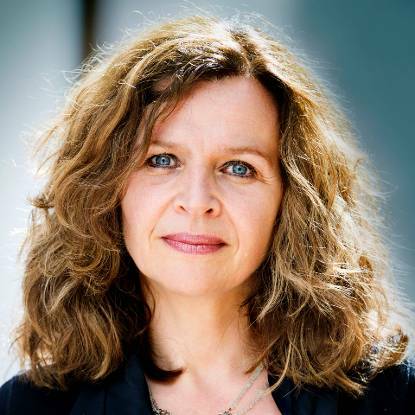 The Dutch Minister of Health, Mrs. E.
Schipper is now fully betting on curbing launch prices of new medicines, actually by searching a collective purchasing in Europe. 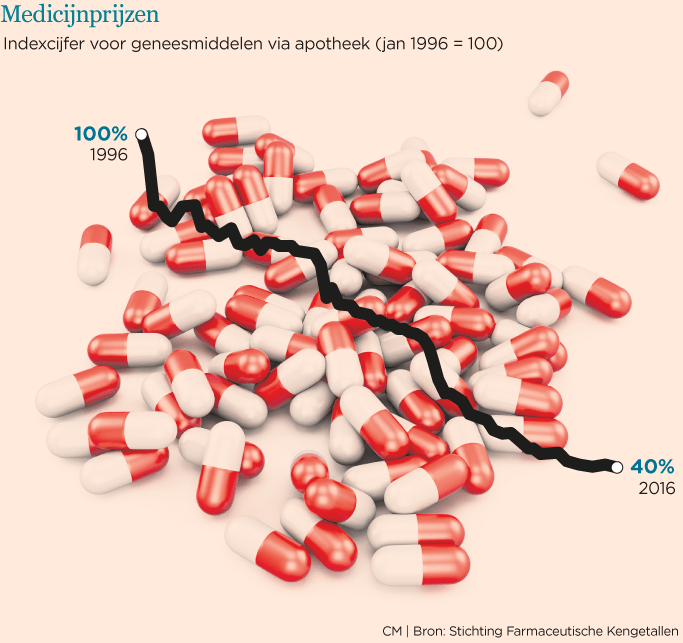 The drop in pricing is due for the largest part to the effect of the introduction of the new Law on Pricing of Medicines in the Netherlands, 20 years ago. This law dictates a maximum price which is based on the average price of the same drug in Belgium, Germany, France and the UK. Manufacturers of drugs are forced to lower the prices of the drugs because their patents expire after a number of years. E.g. Astra Zeneca has lowered the price of the stomach protector, Nexium, with 59% in five years. Prices of patented medicines are going downwards be it less strongly, because of the introduction of similar drugs by the competition. Patents on drugs are already necessary in early stages of discovery and development of the active ingredients of the drug, long before the forthcoming medicine can actually be sold on the markets. The price of an expensive drug like the frequently prescribed anti-inflammatory drug Remicade, has been lowered in price by 19% in the past 5 years. Also, the Minister uses pricing schemes in granting access to the market for new drugs, that depart from the volume of the drug in the market, i.e. when more is sold, less should be paid per drug. These lowering prices have given the Dutch government a lucky break in expenses in the past few years. In 2014 and 2015 the government did spend more on medicines prescribed by a GP (“huisarts”), but the rise was lower than expected. Rise of these expenses was limited to 3,3%, bringing total expenses up to a € 4,3 billion. This meant a godsend of a saving of € 58 million. The years 2012 and 2013 have also seen a lowering of expenses of drugs in absolute numbers. However, the Dutch Pharmacists Organization cautions that lower prices do have adverse effects: in the past few years hundred of medicines have been out of stock and have sometimes not been available to patients as producers did not want to, or have not been able to deliver them. Earlier this year the fact that Thyrax, the medicine for thyroid patients could not be delivered, created some commotion in public. Three years ago a Transparency Register Healthcare was established into which the industry is obliged to report its payments and sponsoring to individuals and organizations: unique in the word. It appears that the industry has paid in 2015 36% more than in 2014. Of course some people urge themselves to state how culpable the industry is making these payments. Actually, all stakeholders in care could easily be blamed about their ‘greedy’ intentions as long as one doesn’t look at the broader structure of the healthcare market. Apart from the cases in which the industry has indeed been rightly accused of dubious activities, it is just too simple to curse them of having imminently false intentions. The amount of sponsoring by the industry can also be seen as a token to their role as a true stakeholder in healthcare. for example lies at the basis of their existence. Recent report from PatientView indicates that lack of funding is a significant hurdle for patient groups around the world. In 2014, it was a key concern for two-thirds of them. Also, sponsoring of research of new medicines by universities and research hospitals lies at the heart of medical innovation of therapies. A lot of medical research could not do without the industry’s collaboration. A recent Dutch initiative around research of drugs for cancer, has resulted in a cooperation between Dutch oncologists from about 12 research hospitals/universities with in principle 6 pharmaceutical companies to test applications of existing drugs for different types of cancer. Recent results of such collaboration have already been published around Folfrinox in the Lancet Oncology. The American Association of oncologists ASCO launched the same initiative and the Canadian oncologists expressed their intention to join. The process around drug pricing in the Netherlands shows how the different parties in the issue of pricing of drugs are prisoner over each other in the same context. The one is the opposing interests between investments in medicine and costs of medication. It is the contradiction between the investors’ urge for ever higher profits and the health care payers’ drive for ever lowering costs of care. The other is the short-term perspective of enforcing power to lower prices and the long-term perspective of constructive collaboration to continuous innovation of healthcare to better outcomes and less costs. Instead of mitigating between interests, one assumes incorrectly that one party might have power over the other. It looks like a conflict rather than a common development for the general interests of better care. Now it is the time to develop a more coherent concept of healthcare development. A concept that recognizes each stakeholder’s legitimate place at the table of collaboration. The pharma industry can never become a stakeholder in healthcare if they are not recognized as such. The idea of such concept is not captured by ‘power play‘ of the Minister of Health, though with the best intentions. (see Medicines Policy Plan, Jan. 2016). to find with them a balance between investment and return in which the parties share their returns among the partnership to facilitate their very collaboration. 1) In the Netherlands there is a specific law on pricing of “expensive” drugs. Costs of drugs that fall in the category of “expensive drugs” are regulated in a ruling of the Dutch Healthcare Authority (NZA). In 2002 a new ruling was issued that said that hospitals could receive a reimbursement for these drugs up to a maximum of 75% of the actual costs. An expensive drug was defined as a drug with a cost of € 10.000,- per patient per year. Recently however medications that costs less than this amount, can still be listed formally as “expensive” drug. The list is formalized by the Dutch Healthcare Authority. See Wijziging dure Geneesmiddelen 2015.